EDF Energy has announced preferred bidders for major work packages at its proposed new nuclear power station at Hinkley Point. The combined contracts are worth over £1.3 billion, with around 60 per cent of value going to UK companies. 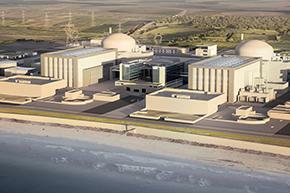 The preferred suppliers are named ahead of EDF’s final investment decision (FID) on the project. Balfour Beatty Bailey (joint venture of Balfour Beatty and NG Bailey, both UK) – electrical cabling and equipment installation. Cavendish Boccard Nuclear (joint venture of Cavendish Nuclear, UK, and Boccard, France) – mechanical pipework and equipment installation. Actan (joint venture of Doosan Babcock, UK, and Axima Concept and Tunzini Nucleaire, France) – heating, ventilation and air conditioning. These three joint ventures form the so-called FID7 alongside the previously announced Alstom (turbine hall), Areva (nuclear steam supply system), Bylor (civil works) and Costain (marine works). EDF Energy has been encouraging UK manufacturers to consider partnerships with French companies in its established supply chain. Weir – large pumps for cooling water. Clyde Union – main pumps for feedwater system and cooling water system. ABB UK – power transmission. Laing O’Rourke – construction of workers’ campus accommodation. Premier Interlink WACO UK Ltd – construction of temporary buildings. KBR – project management of site operations and equipment contract management. Jacobs – project management of building and civil work. Gleeds – contract management services. Faithful+Gould – contract management services. Turner and Townsend – project controls and project management. Mace – contract management services. The major supply chain partner companies will let sub-contracts for manufacturing work, potentially allowing many more firms to benefit from the project. EDF Energy chief executive Vincent de Rivaz said: “Hinkley Point C will be at the forefront of the revitalisation of the UK’s industrial and skills base, and we have worked hard to build a robust supply chain to support new nuclear in the UK. EDF says that all parties are working so that a final investment decision can be taken at Hinkley Point C as soon as possible.